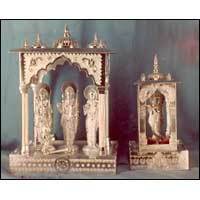 We are recognized as one of the staggering Decorative White Metal Products Suppliers, based in India. The White Metal Handicrafts are highly durable, robust in structure and requires low maintenance cost. Additionally, customers are eased with the availability of the White Metal Designer Handicrafts in varied sizes, shapes and dimensions as per the specifications provided.